St. Petersburg in December is a very dark, very cold place. The dark is more shocking than the cold. In fact, in coastal St. Petersburg, it’s not much colder than New England. This week, for example, lows in St. Petersburg are a balmy 29°F, while here in Boston we’re bracing ourselves for a week of -3°F nights. The dark, however, is a real challenge. For most of December, the sun rises at 10am and sets around 3:30. It never quite feels like daytime: the sun arcs low across the sky, resulting in sort of a 5 hour-long sunrise/sunset. So it’s not hard to see how New Year’s Eve, a holiday celebrating light and warmth, becomes the bright spot of a Russian winter. It requires feasting long into the night, visiting with friends and family, and, of course, a multitude of toasts to health and good fortune. During the Soviet era, when it was forbidden to celebrate Christmas, most of the Russian Christmas traditions were ported over to New Year’s Eve, and they’ve stayed there ever since. A typical Russian New Year’s Eve spread consists of lots of small plates, salads, pickles, breads, and plenty to drink. 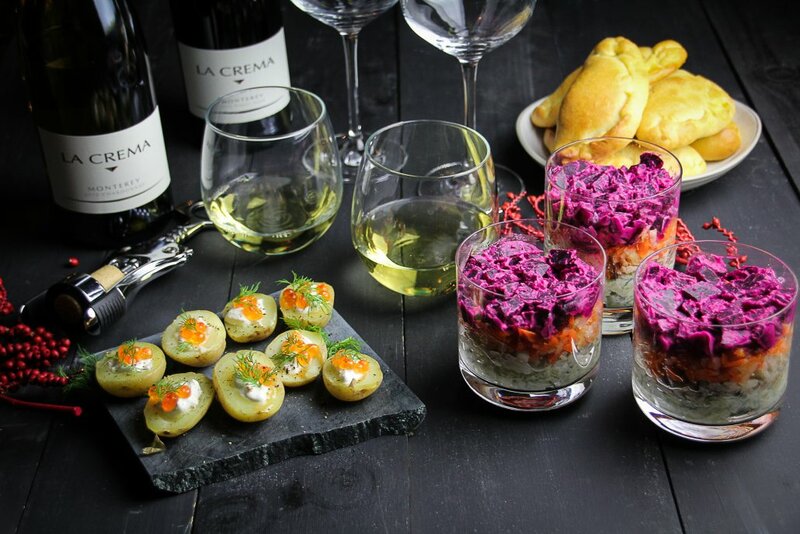 In our paired down, Americanized menu, we are including three recipes: Potato Bites with Caviar, a modernized “Herring Under a Fur Coat” salad (more on that later! ), and addictive Mushroom Pirozhki, or little pies. First up, Potato Bites with Caviar. I think these may be the easiest holiday appetizer ever. 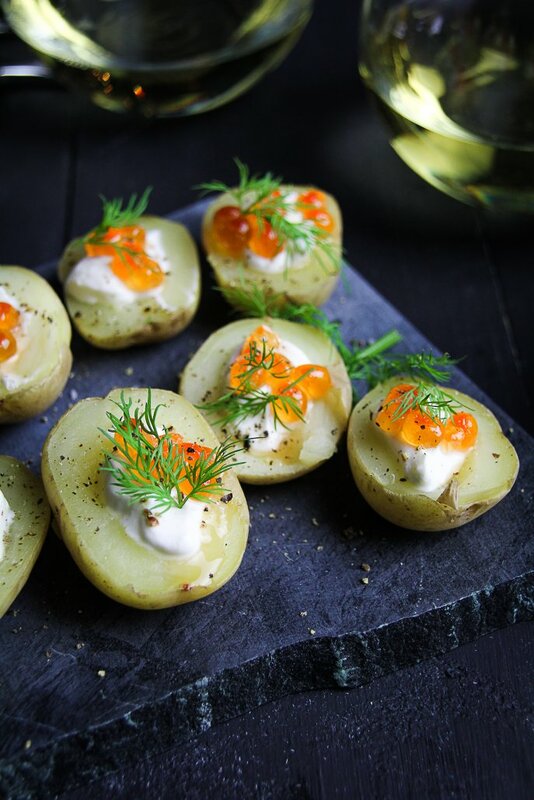 All they require is boiling a pot of small potatoes, slicing them in half, scooping out a bit of the center, and dolloping each potato half with sour cream, a few pearls of caviar, and a tiny sprig of dill. That’s it – that’s the whole recipe in one sentence. And they are delicious! I was surprised by how addictive each little bite was. I made them once to photograph this post, again a week later for Christmas Eve, and I’m thinking they would be a very easy thing to bring along to the NYE party we’re headed to on Sunday. Despite their simplicity, these Potato Bites are still festive and impressive. Of course, caviar is a bit of a splurge – even a little jar of salmon roe will set you back at least $20. But I stick to the affordable varieties and think of it like buying a nice cheese. A little goes a long way, and whoever you’re serving, whether it’s just your roommate or a crowd of 40, will inevitably say “oooh, caviar” when they see the platter. While vodka is the traditional drink at a Russian New Year’s party, there’s plenty of room for other libations. 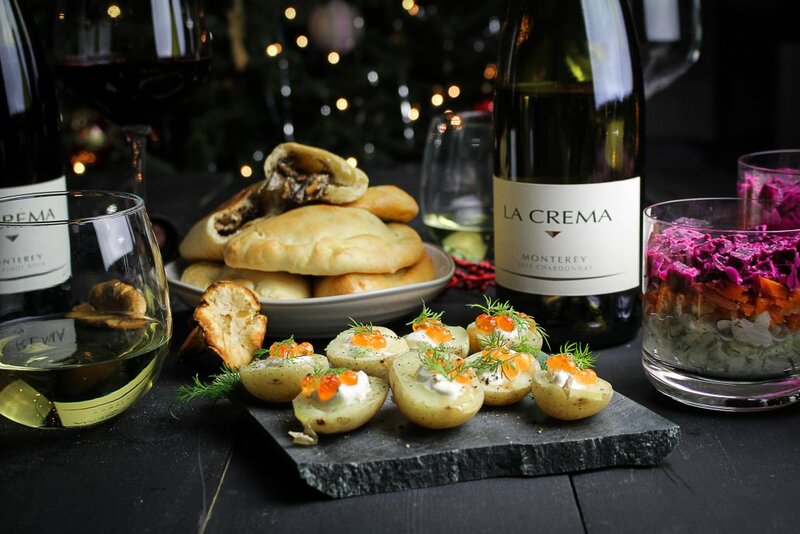 Of course, we’re serving wine, and with these potatoes, the La Crema Monterey Chardonnay is a great choice. 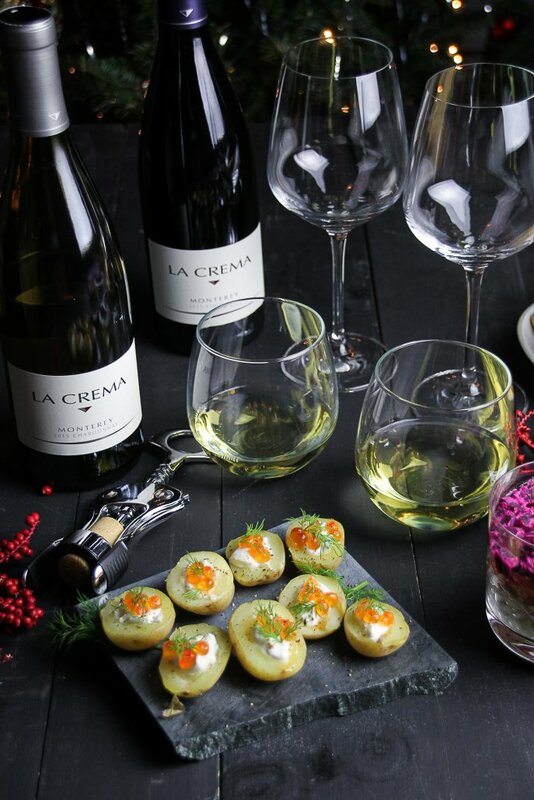 Serve both the potato bites and Chardonnay chilled and get ready for a fabulous evening! Wash the potatoes and add them to a large pot. Cover the potatoes by at least 1 inch with cold water. Salt the water generously. Bring the pot to a boil over medium heat, then boil the potatoes until they are just barely tender when poked with a fork, about 5-10 minutes depending on the size of the potatoes. Remove one potato, cut in half, and test for doneness in the center. When the potatoes are tender all the way through (but not falling apart!) drain the potatoes. Set aside and let cool completely. Cut each potato in half lengthwise. Using a small spoon, scoop a bit of the center of each potato half out. Fill the scooped out area with 1-2 teaspoons of sour cream, then top the sour cream with 4-6 pearls of caviar (about 1/4 teaspoon). Place the potato bites on a platter. Place one sprig of dill on top of each potato bite and grind black pepper over the top of the potatoes. Refrigerate until chilled. Serve cold.